A contest with a difference took place aboard USS Wessex in R4. 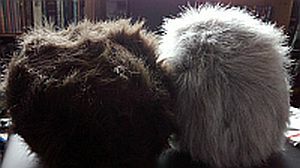 Chief of Communications Ros Haywood has acquired two tribbles: one brown, one grey (she’s British, so her spelling is different, too). They had no names! So a ship’s contest was quickly devised and, with the CO’s consent, opened to the Wessex crewmembers. All they had to do was suggest names for the cute furballs (oops, extraterrestrial life forms). The winning names are ‘George’ and ‘Gracie’ (hmmm, sound familiar?) and were suggested by Chief Engineer Chris Barrie and Medical Technician Roberta Staymates. The prize? A keychain with a 3-inch tribble on it. 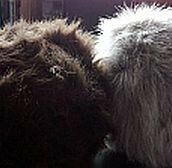 As you know, having a pair of tribbles is no problem. They only reproduce when they get fed (especially overfed). At the moment, the noise level is incredible, as they shriek every time Commodore Haywood’s Klingon targ sneaks up behind them (which has rapidly become the targ’s favourite hobby). Well . . . labour, honour, colour, flavour, savour, favour, or centre and tyre. Jolly good show, old chap !!! So, how can I enter these contests?